Camping privileges are provided for established chairmen, co-chairmen and volunteers who work a minimum of 4 full days during the convention. Camping privileges are provided to volunteers who have met the above criteria during a previous convention. First time volunteers pay their initial camping fees in their “rookie” year. Chairmen are to provide SUN ‘n FUN with documentation of service by entering volunteer hours at the end of service or provide volunteer cards to record hours for volunteers to receive these privileges. The Chairman must submit all Volunteer Camping requests on through the Credential & Equipment Request website. Please request camping for only those volunteers who have confirmed their need for camping for the current year. Please make one camper permit request per unit/volunteer couple (i.e. do not list camping for husband and wife). Volunteer Camping is provided in the Convention Campground or in an area designated by the Chairman and approved by the Convention Chairman. Campground areas are primitive with facilities nearby. Volunteer campers will be allowed to camp anywhere in the convention campground except for designated locations (Volunteer camping is prohibited on Juliette along the first row near the taxiway ”Papa”). A map will be provided at check-in. Volunteer campers who wish to camp along Juliette may do so by securing a regular camping permit by pay the required fee for the required period. Volunteers who require a permit to PARK ONLY (Auto) in the Campground should receive a BLUE & WHITE Convention Site Parking pass. DO NOT REQUEST A CAMPING PERMIT FOR VOLUNTEERS WHO ONLY NEED AUTO PARKING IN THE CAMPGROUND. Camping for Camp Duffy (formerly BackAcres) must be requested through the Credential & Equipment Request by the Chairman of the area. Approval will be based on qualification, availability and need. Space and eligibility for Camp Duffy is extremely limited. ALL VOLUNTEER CAMPGROUND CREDENTIALS ARE TO BE PICKED-UP AT CAMPER REGISTRATION STARTING ONE WEEK PRIOR THE EVENT. 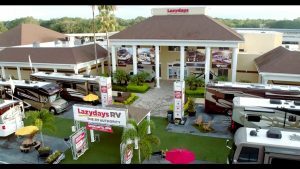 Come to SUN ‘n FUN in Style – Rent from Lazydays RV – Official RV Sponsor of SUN ‘n FUN! At Lazydays RV Rentals, we’ll make your RV dream a reality without all the hassle. As the world’s largest dealership, we know not all RVers are the same. Whether you want a weekend of tailgating or a camping adventure, Lazydays RV Rentals has the motorhome or travel trailer for you. Our RVs are move-in ready with accessories, supplies, and additional options available upon request. WHY RENT AN RV WITH LAZYDAYS? Click Here to Rent an RV!